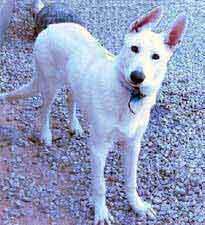 Stryker is an 11 month old, purebred white German Shepherd Dog. He has been diagnosed with hip dysplasia, and his owner brought him to the vet to be euthanized because of it. Thankfully, the vet fell in love with Stryker and had him seen by a specialist. The specialist confirmed the diagnosis of mild HD and recommended restricted exercise for 2-3 months with medication (anti-inflammatories - Deramaxx). 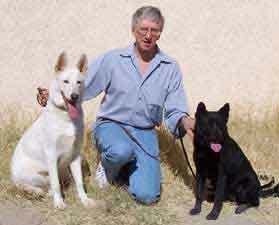 Thanks to Scott of German Shepherd Rescue in Las Vegas, and Becky and Phil of Dobie Rescue in Las Vegas, Stryker will be on his way to Phoenix on Saturday in search of his forever home. Becky and Phil will retrieve Stryker from the vet on Friday, give him a place to stay until Saturday morning and then head off for Phoenix. THANK YOU!! We have found Stryker a home for the holidays!! Our deepest thanks go out to Betty, who adopted our senior Heidi from us in 2003. 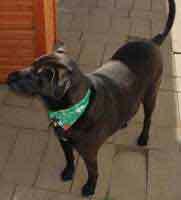 She has agreed to keep Stryker safe and give him a loving home in which to spend his Christmas and New Years. We will know more about Stryker after his temperament evaluation on Saturday. He will be available for immediate introductions. As with all of our rescues, Stryker will be neutered, up-to-date on shots, Buddy Tagged and microchipped prior to placement. If adopted within the 2-3 month restricted exercise and medication period, Stryker's medication will also be provided by our rescue. UPDATE 12/17/05: Stryker has arrived! 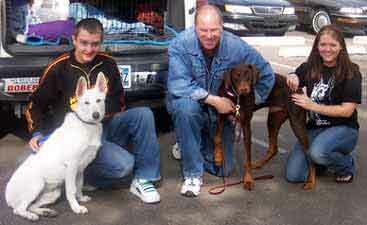 Courtesy of Phil (middle at left) from Las Vegas (who also transported a dobie for Dobie Rescue here in town), Stryker arrived safe and sound this afternoon. And what a beautiful, personality plus puppy he is. He bounded out of the truck and greeted two of our volunteers (David at left and Katherine) and our staff member without hesitation. He rode well in both transport vehicles. He is crate trained and housebroken and we are delighted to find that he gets along with gentle dogs of either sexes and cats. 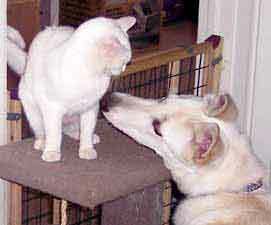 Foster Mom Betty has already given us an update -- the 4 house kitties have adopted Stryker. Please check back for updates as we learn more about this loving youngster. 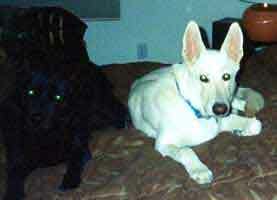 "Left Boomer and Bear outside and Gypsy and Stryker inside. Keep in mind before I leave for work, everyone has eaten and pottied so I can see visually that they have done their jobs. I decided to leave Stryker out of the crate. He did very well. Came home at lunch and let them outside for a potty break. No visible signs on the rug or floor of any messes. Let them outside a second time before going back to work. Stryker did his #2 and 1. "Came home from work, no visible signs on rug in living room but did notice on the sheet on kitchen floor that I had put down for the Boomer's dirty feet yesterday, that there was a wet spot. Could have just as well been Gypsy since she did act like the guilty one when I came through the door. Could also have been from all of them drinking water and drooling after I had let Boomer and Bear in. Which does happen sometimes. But what are washers for? No poopies or anything nor any destruction. All  kitties still alive and well. So, I will not hesitate in doing that again tomorrow. 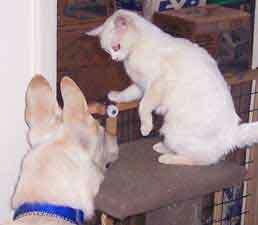 "Last night he couldn't settle down after the lights were out, so I did get up and crate him. Not a peep. So that will be my option for tonight if need be. I think he just got all wound up after he had rested from his eventful day. Tonight we will see if that is the case. Last night he felt comfortable enough to take the toys & bones next to and near Bear without her doing anything. He feels comfortable enough to play with their toys and grab what interests him from the box to play with to occupy himself. "I noticed Stryker likes the knotted tug and carries that around from room to room with me. Shakes his head and throws it around. Enjoys himself. Just like he's been here a while." UPDATE 1/6: Stryker continues to thrive and do well with his foster family. The medication seems to he helping his hips and, because he feels more comfortable, he is able to get the gentle exercise he needs to build up his strength in that area. He has months of neglect to make up for, but under his watchful foster mom's eye, he's making progress every day. He is learning basic obedience and taking to it like a duck to water. This is one smart boy. UPDATE 1/28: Stryker is finishing up his course of meds, after which we will have his hips re-xrayed and see what Dr. Bone has to say for his future. 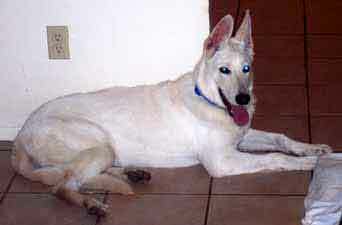 So far, all of Stryker's medical needs have been taken care of by the Good Samaritan vet who saved him from euthanasia. 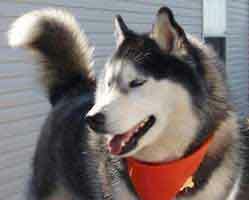 Now Stryker needs your help. We will soon be undertaking the expense of having Stryker's hips re-evaluated by a specialist at a cost of approximately $300. Depending on the vet's opinion, Stryker will either continue on a course of medication or could possibly be a candidate for very expensive hip replacement surgery. This boy is so young and we'd really like to give him a chance at a long, healthy and pain-free life. Can you help? UPDATE 2/9: Thanks to your generous support, Stryker was able to see the hip specialist today. Unfortunately, the news is not as good as we had hoped. While Stryker is MUCH improved since we got him 2 months ago, his hips are in pretty bad shape. The good news is that the medication that Stryker has been on has left him virtually pain free, enabling him to build up the muscles that had been so neglected. The bad news is that Stryker should not be on the medication long-term as it can have costly side effects. The vet suggested finishing up the last of Stryker's meds and putting him on Glucosamine-Chondroitin supplementation. He said that Stryker no longer needed to be restricted in his activities as continuing to build his muscles was of primary importance. We discussed the possibility of hip surgery (femoral head excision or complete hip replacement). 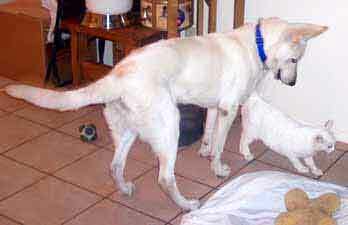 Since Stryker is so young and still growing, the specialist felt that there was a chance that Stryker could "grow into" his hips, learn to use his muscles to compensate and be able to live a reasonably comfortable life. Swim therapy was highly recommended. Our course of action will be to give Stryker the G-C supplements and food containing G-C, and allow him to lead a normal life and play and exercise to his heart's content in order to continue to build his muscles. We're looking for somewhere where he could swim -- or an adoptive home with a pool would be perfect! Stryker will never be a frisbee dog or a fly-ball competitor, but he has a big heart and a lot of living to do and love to give. UPDATE 2/12: Stryker is growing into quite the handsome young man thanks to Foster Mom Betty, who reports that Stryker is enjoying his new found freedom to play as he wishes. He was sore from his visit to the specialist, but that was completely understandable considering the manipulation that was done. However, today he is up and running with no sign of pain or ill effects. According to Betty, "He is not acting like he is bothered by anything now. For example, he is too energized and wanting to play, etc. If he were really bothered and in any discomfort, I am quite sure that he wouldn't be getting up consistently from a lying position to play with the other dogs or cats. He hasn't had his meds (anti-inflammatories) today but he did have it yesterday. I will not give it to him unless he shows signs that he needs it. Better to wean off then just presume he is uncomfortable. I did notice again today, although at times he is the bunny hopper, he does use his back legs with no problems or hesitation when wandering around and playing with the other dogs. We are tapering off his anti-inflammatory meds and he will soon be on just the Glucosamin-Chondroitin supplements as prescribed by the vet and Cosequin and aspirin for any discomfort. Please check back for updates. GREAT NEWS!! Stryker has been accepted by Canine Physical Rehabilitation of the Southwest. 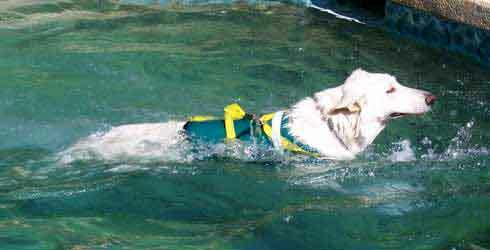 Thanks to your generous donations, Stryker began his water (swim) therapy today. Stryker has a family!! 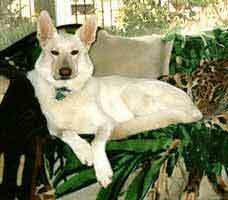 Our heartfelt thanks go out to Robert, who recently lost his white GSD. 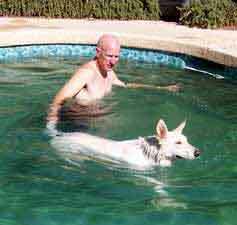 Robert's shepherd had HD, and Robert spent the last 5 years caring for the special needs of an HD dog. When he read Stryker's story, he knew he could give our boy the home he needed and deserved. Raven wasn't quite so sure at first, but she's happily accepted Stryker into the family and all is well. Thanks to all who donated to help this boy. Without the evaluations (hip specialist and therapy), we could not have provided the information that Robert needed to be able to take Stryker on. We couldn't have done it without YOU! 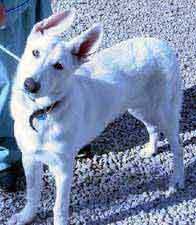 From Stryker's adopter, Robert, in August 2015: "I noticed your website still shows Stryker listed. 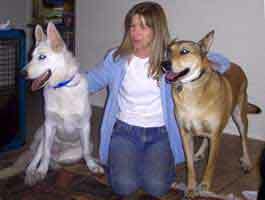 You may recall we met in northern Arizona where Raven & I adopted this awesome boy years ago. 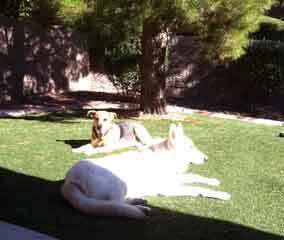 Stryker is still active and has a new sister since Raven passed over a year ago. His hips are slowly deteriorating and he now has arthritis but he is a fighter. Just wanted to send an update and say thank you again. I could not have a better friend. Best regards, Robert"